When I did a Q&A with Billy Yost, front man for The Kickback, back in September, the band were fresh to Chicago from South Dakota and planning to record new music at Engine Studios. The result is this month's release, Great Self Love, a 4-track EP sent to me with details describing each song as a separate act, all coming together in what seems to be the story of the downfall of the news industry, or the downfall of a generation, or perhaps the downfall of society as a whole. In any case, something's going down the tubes and these four gentlemen are giving us a rock-and-roll play-by-play. Musically, the style here is passionate, sometimes fiery alt/indie rock with hooks that are present enough to make you want to listen more than once, but subtle enough not to wear themselves out too quickly. While the four songs gel together to tell the overall story, each has a distinct personality. Opening track "Indigenous Newspapermen Circa 1980" (which I daresay will never have to worry about sharing its title with another song), is probably the strongest and most immediate, featuring a big, open sound, an anthemic chorus and some wonderful guitar hooks. It's tough to make out exactly what Yost is singing, but this is the sort of music in which the words aren't necessarily all that important - the overall feel is what matters most and the band have that down. "Rough City," described as " a loving nudge at the only city we grew up knowing and the relief of not having been from there," has a moody, melodic vibe and is another standout track. Rounding out the EP is the most aggressive, rocking number, "Counselor," followed by "Burner (Things I Know About)," a downbeat ending to the story that closes things out with a menacing air and a refrain of "we're dead in the water." 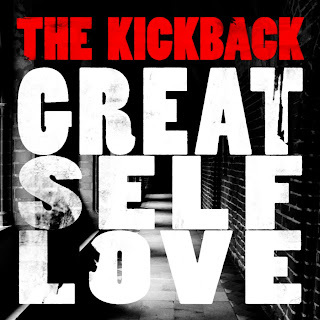 Over its four solid tracks, Great Self Love makes it apparent that The Kickback are a band with plenty of compelling ideas plus the talent to back them up. Visit their site to hear for yourself, or see them live at Bottom Lounge on Friday, January 22 with Camera, Land of Lincoln and The Vindits. $5 advance, $8 day of show. Click here for tickets and more information.